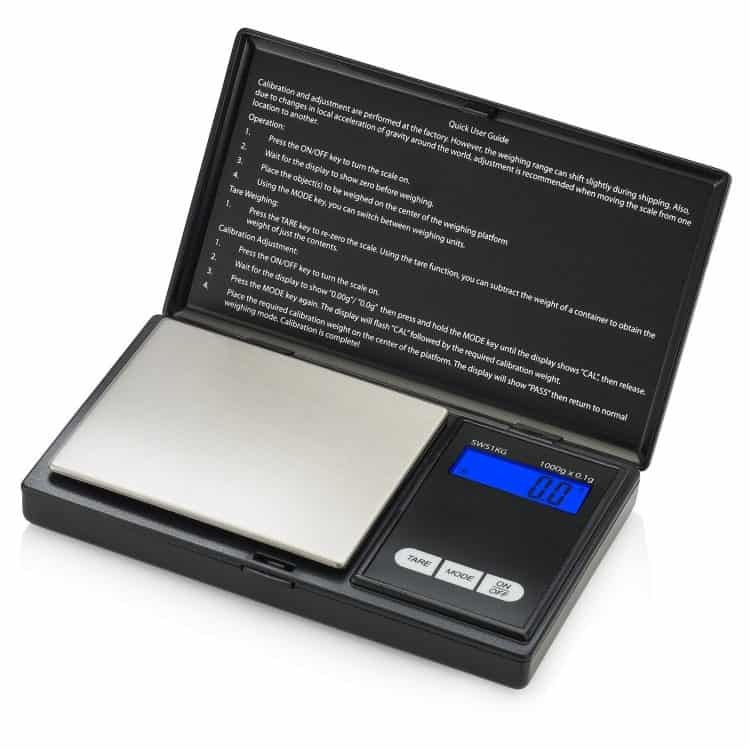 Every time you visit your local cannabis dispensary to buy flower, you’ve probably noticed that they use a scale to weigh out your product. 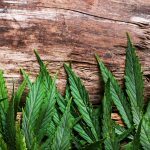 Not only is it required for specific state regulations, but measuring their weed in this way allows them to keep careful track of their inventory as well as making sure you are getting exactly what you’re paying for. Since these companies are so careful, why on earth would you need your own scale? The reasons for investing in your own weed scale can vary, and the priorities you have for it can seriously influence what you buy and why. 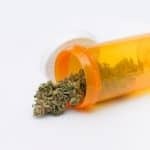 Whether you’re looking to double check your stash at home just to make sure you didn’t get ripped off or you want to ration your flower to ensure it lasts, there are a range of factors to consider. 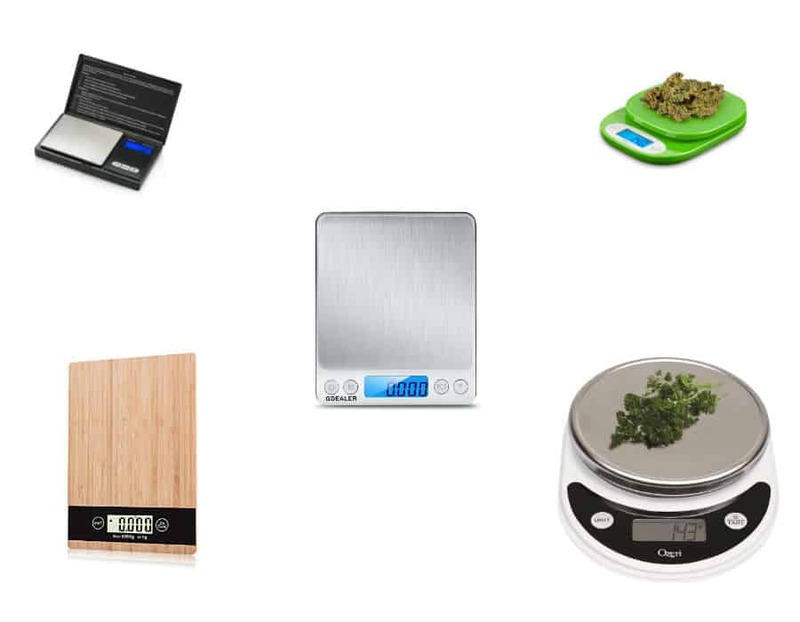 Let’s take a look at some of the best scales that you can use for weighing your weed at home. 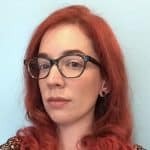 Nowadays, digital options are the optimal choice for convenience and accuracy, so we’ll dive deep into the array of options before you. First, it’s important to understand what makes a scale worth your time and money. Above all else, make sure your scale measures in grams. Since Americans don’t use the metric system, some products sold in the US may not offer this feature. We all know that accuracy is important, and many assume that all scales are the same. 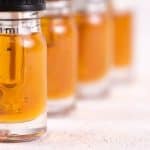 Ensuring that the scale you buy measures within at least one-tenth of a gram will be more valuable than you may realize. Most scales will be battery powered and as long as you’re using it for occasional personal purposes, that’s probably fine. Weighing in bulk repeatedly may warrant a plug-in version. It’s also important to evaluate your budget, as some of the market’s best digital scales may set you back a handful of bills. While they aren’t incredibly expensive, there’s something to be said for the quality that comes with paying more than $5 for a measuring device. Now that you know what to look for, let’s look at the market’s top 8 options for weed scales! For those who don’t want to spend a lot of money on their first weed scale, this option takes the cake. In addition to being lightweight and incredibly portable, the Smart Weigh uses an easy to read digital screen with large buttons - your grandma could literally use it if she wanted to. Accurate within one-tenth of a gram, you can use this scale to weigh up to 1000 grams of product. This scale even offers various modes depending on how you prefer to weigh your flower, but in most cases, we’re pretty sure you’ll stick with the gram function. You also have the option to weigh your product in a container using the handy tare button, or if you’re a purist, you can put your weed directly on the stainless steel platform. At $12.50 with free shipping through Amazon Prime, it’s a great starter scale or portable backup. 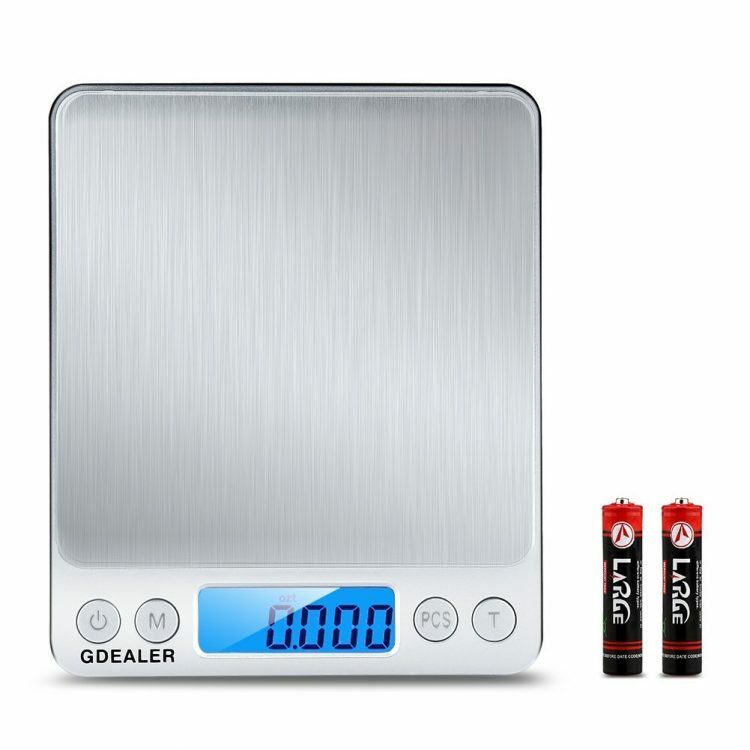 Sometimes looks do matter when it comes to the items you have in your home, and this digital scale by GDEALER comes with a sleek design that will make you want to leave it on the counter even when you’re not using it. Using a large backlit digital readout, this scale is incredibly accurate, measuring product to within one-hundredth of a gram. While it may not have as much capacity as other options, you can still accurately weigh up to 500 grams. Like most other scales on the market, this one comes with large and easy to use buttons for tare, measurement modes, and even counting multiple pieces of an item. It comes with two plastic cases that allow you to contain your nugs that are extra kiefy without having to clean up a big mess afterward. The GDEALER scale is $10.99 on Amazon with free Prime shipping. Let’s say you purchased a small amount of weed and you need to measure it out to incredibly specific portions. Perhaps it’s a part of your rationing methods or you want to share some equally with friends. Whatever the case may be, having the ability to be extra accurate is sometimes far more important than being able to weigh in bulk. That’s where the GEMINI-20 comes in! With a maximum capacity of only 20 grams, this small scale can accurately measure to within one-thousandth of a gram and is quite possibly one of the most precise options available. A metal reservoir keeps your flower in a neat little bundle as you navigate using tare and mode buttons to see your results on a large screen. A plastic flip-down cover protects the weighing area, ensuring that your measurements are always accurate. The GEMINI-20 is currently priced at $26.88 on Amazon with free Prime shipping, although don’t expect that value to last long. Its normal list price is closer to $65.00. If you’re often behaving like a bull in a china shop, the Etekcity scale might be right up your alley. 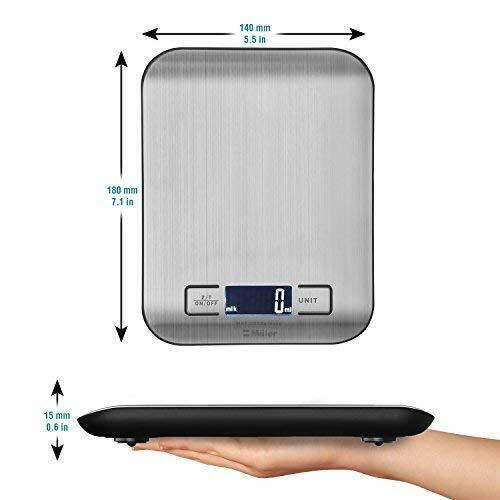 While other scales feature sensitive measuring surfaces and are designed to be used quite delicately, this multifunction scale features a tempered glass surface, non-skid padding underneath, and rounded corners just to make sure you’re safe. You can’t throw this scale around by any means, but it’s perhaps one of the more durable options out there. 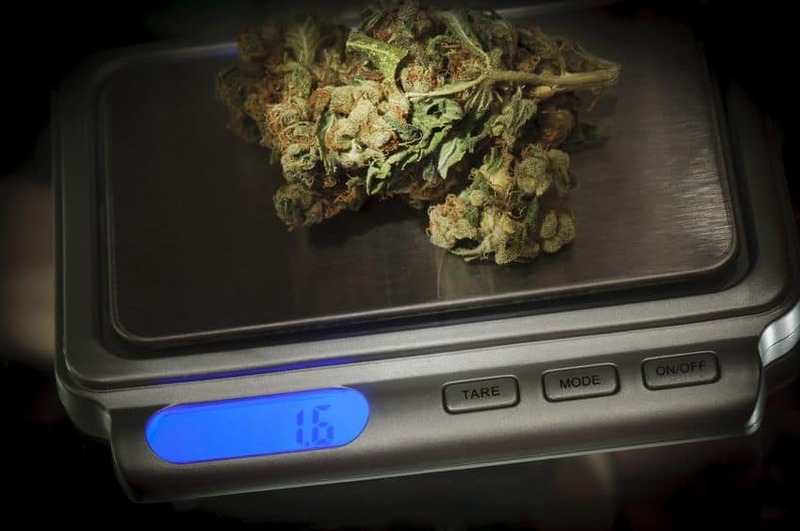 Like most digital scales used for measuring weed, you’ll have an easy to navigate set of buttons, including a tare function that allows you to use any type of container you like and still get an accurate reading. 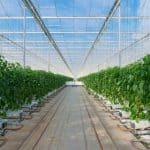 A super large LCD display makes reading your results a snap, and you’ll have confidence knowing that your flower is carefully measured to within one-tenth of an ounce. You can weigh up to nearly 5,000 grams, making this a great option for bulk operations. 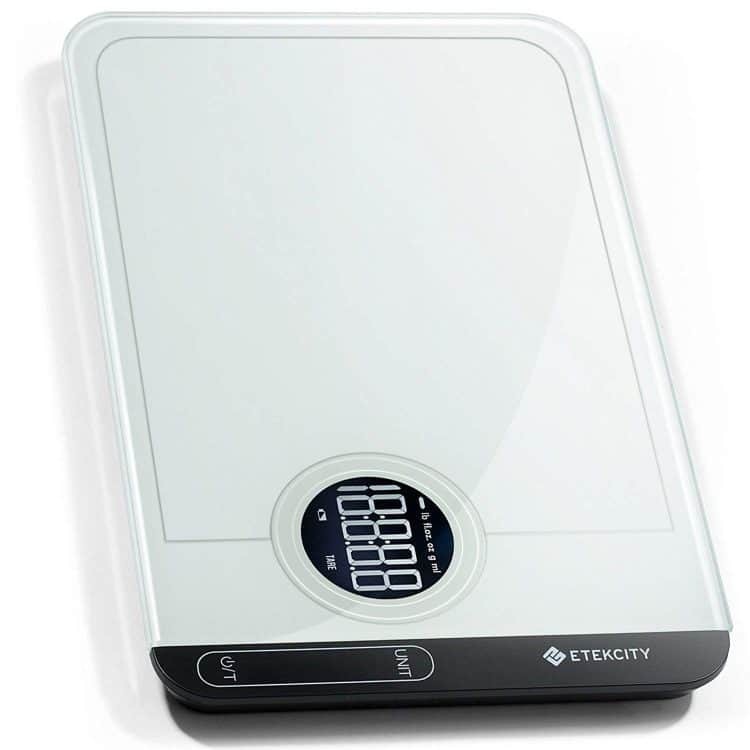 Etekcity’s scale is currently priced at $16.99 with free Prime shipping on Amazon. List price is $18.99, making this option affordable on nearly every budget. There’s no rule against expressing yourself while weighing your weed, and the Ozeri Pronto scale gives you tons of colorful options to make this task a little more fun. Seven options in total all feature a newly enlarged metal weighing surface with varying tones that can match your kitchen decor or scream a little more personality into your life. This unit runs on AAA batteries and has a 2-minute auto shut off feature that helps to preserve battery life. A large tare button makes this scale easy to use, and you can switch between five different units of measurement if needed. While it does measure over 5,000 grams, it’s important to note that it only calculates within one whole gram, meaning that you shouldn’t use this scale for more precise situations. 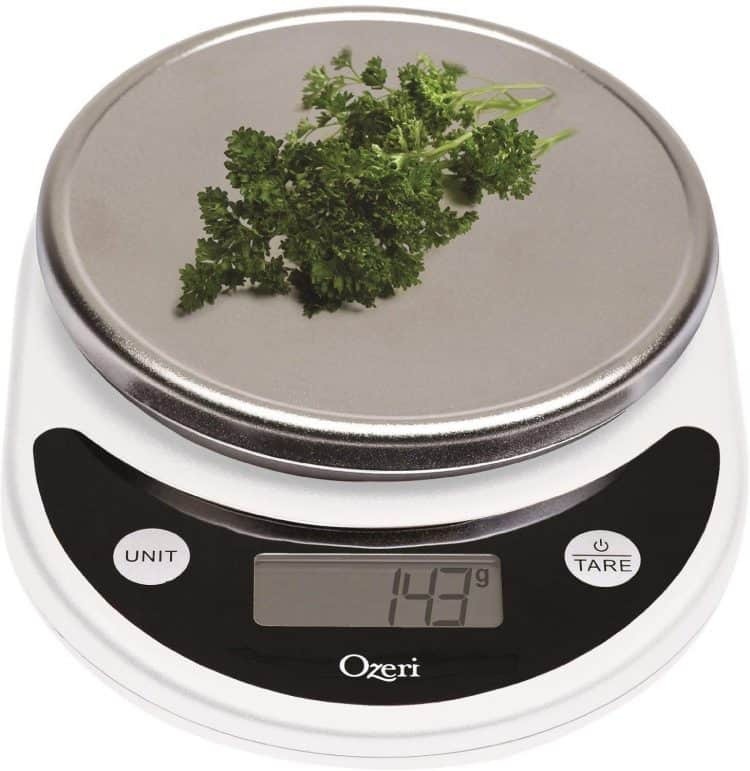 Depending on the color you choose, Ozeri’s scale ranges from $11.39 to $19.94 with free Prime shipping available. 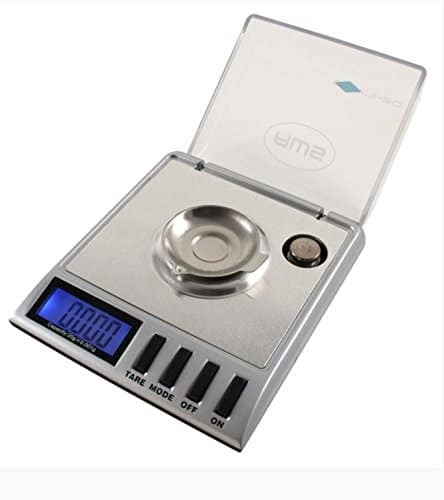 A fairly compact and sleek option for weighing your weed at home, this digital scale by Mäier is lovely enough to keep on your counter and functional enough to use for more than just marijuana. Boasting Japanese technology that’s highly accurate, this scale uses four transducers to determine accuracy to one gram. Individuals who need to weigh bulk amounts of flower may find this to be the most desirable option given its compact design. 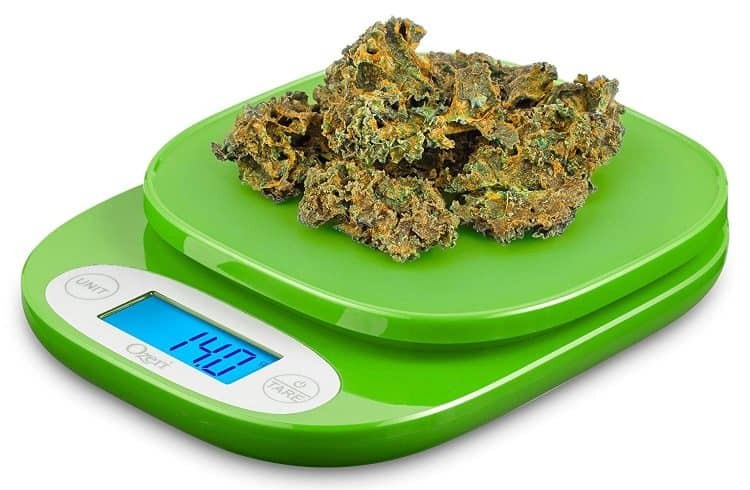 Battery operated and measuring smaller than a piece of printer paper, this Mäier scale is a great choice for those who are just getting into measuring their weed at home. You’ll also get the benefit of a 2-year warranty, and at $11.97 with Prime shipping, you can’t really beat that deal. 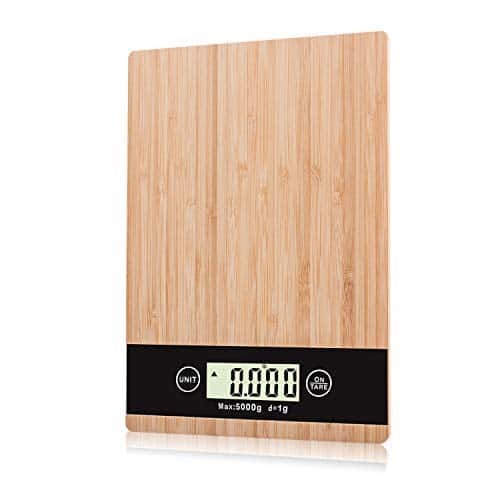 If you’re not into the industrial stainless steel look, this bamboo scale by YZGLIFE gives you amazing accuracy without sacrificing your stylish side. Measuring within one gram and accommodating up to nearly 5,000 grams, it’s a scale that you’d be proud to take with you anywhere. Although it may not be pocket-sized, YZGLIFE’s scale is battery powered, avoiding the need for tangled cords and letting you utilize its precise power anywhere you like. Rather than fussing with a ton of buttons, this design utilizes only two yet still gives you tare and multiple unit options with ease. A large LCD display will let you know when you have low power, and an auto-shutoff feature makes sure your batteries last. As an added bonus, bamboo is an anti-bacterial material and is highly resistant to scratches. A price point of $17.99 with free Amazon Prime shipping gives you the ability to weigh weed in style without breaking your bank account. Do you want to measure large amounts of weed without sacrificing the accuracy in which you do so? 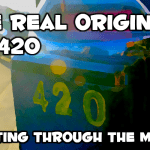 Then Ozeri’s ZK420 may be just right for you - after all, look at the name. This powerful battery operated option weighs up to 6,000 grams and is accurate within half of one gram. No other scale we’ve explored offers that much range with such an easy to use system. Not only do the buttons make it a snap to use a container or not to weigh your flower, but there’s an audible noise when you press them, letting you know that the scale has received your input. A variety of bold colors are available with prices ranging as low as $8.85 up to $11.20 with free Prime shipping included. 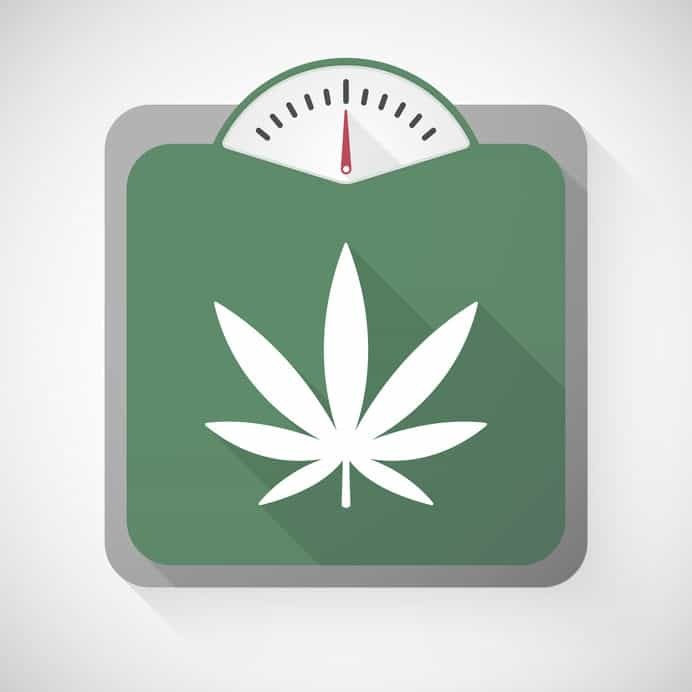 There are some truly great options available when you want an affordable and high-quality digital scale for weighing your weed, so take some time to consider what’s most important to you. Is portability essential, or is incredible accuracy something you can’t sacrifice? Expressing yourself through color or design is also an option, but thankfully you won’t have to worry too much about your budget as all of these scales are reasonably affordable. When you want to take your weed use to another level, make sure to grab one of these awesome pieces of equipment!